These clips from episode one of the Day of the Triffids mini-series were only available to our friends across the pond, but now we've finally got copies to showcase here on the site. The clips are titled "Place Crash," "Security Breach" and "Skies Ablaze" and they're pretty decent save for a couple of sub-par FX sequences. The world is struck blind by a solar storm, and millions of man-eating mobile plants are released to roam Britain. As an expert on the Triffids, Bill Masen knows that salvation rests in the hands of the father he hates, who mutated the Triffids in the first place to produce a green source of oil that the world craves. Those of you who can watch the first footage be sure to fill us in on what it's looking like. For the rest of you, just hang tight. We're all in the same boat here. Oh yeah, and if you missed them be sure to check out the first stills from the mini-series we posted last week. UPDATE: All three clips are now available for your viewing pleasure after the break. What?! Grrrr!!!!! "Not Available In Your Area"?!?! Grrr!!!!! I've just watched the clips here in Blighty and i am happy to say that it looks pretty good on the strength of them. They could be misleading of course but if the massive jump in quality that the BBC managed with the last Torchwood story is anything to go by then i'm definately excited. The old Triffids series terrified me as a kid and the second 'security breach' clip suggests this may do the same for a new generation. I'm working on mutating my son's Pitcher Plants to send after em if they get this wrong. NO WAY. this looks really PONY. BBC produce some of the worst programmes know to man. Although their nature ones are amazing. "Did I leave the gas on? No, no Im a phuckin squirle." day of the triffids, goodness. Well I'm hoping for the best. I just hope they haven't messed with the story too much. 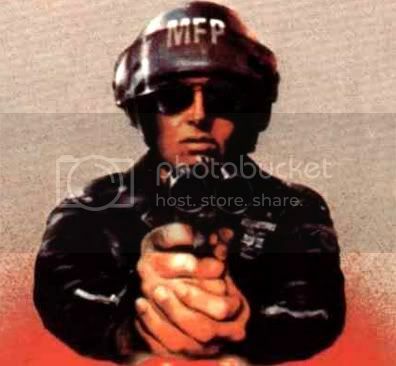 The 80's adaptation was nearly perfect considering the meagre budget. C'mon, people. Killer plants? I saw the original. It was ridiculous then, and modern special effects won't fix the basic silliness of the premise. The book is interesting because the plants are secondary to everything going on. They have nothing to do with people going blind and they sort of just show up here and there. The point of the whole killer plant thing isn't to be an antagonist in the story, but rather to show how fragile our place on top of the evolutionary ladder is. Take away our eyesight, and a plant might be better suited to survival on earth. I hope the mini retains some semblance of this. 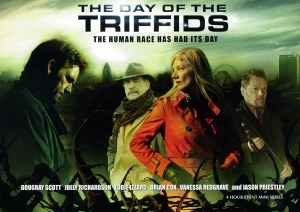 I saw all three clips and Day of the Triffids shows promise, the main criticism I heard about Survivors is the producers tried a little to hard to &acirc;&euro;&oelig;Inclusive&acirc;&euro;&#157; with the casting and a lot of the plot didn&acirc;&euro;&trade;t make sense. DOT strikes me a really hard to screw up, if they stay true to the book I think they&acirc;&euro;&trade;ll have a series that will be entertaining. I read the original Day of the Triffids years ago and Agent Orange is right on point, take away something like our sight and we drop on the food chain. So the question is will we be able to see DOT on the BBC web site or will we in the States have to wait a year like Survivors, a series I&acirc;&euro;&trade;m planning on seeing. What does it mean that BBC tried "a little too hard to be 'inclusive' with the casting"? "What is it with UK TV?? Its got to compete with slick productions like CSI, FlashForward, so why do they do everything on the cheap?" Erm, money. The UK is a much smaller country than the US and the same funds just aren't available. nah screw it, blow up the room. I for one can't wait, I was young when the 1st one was on telly. Man eating plants silly? I suppose re-detonating the sun, re-starting the centre of the earth, detonating nukes on an asteroid, and giving aliens a virus is pretty plausible... I always believed fantasy was just that, fair enought the beeb's special effects department aint all that - mainly due to lighting. Remember they are a public company after all, and dont rely on advertising revenue. It is soooo BAD! Don't waste your time, you'll envy the blind. A ridiculous rip off of 28 days later meets a wannabe Lost/HBO show. There is no point throwing money at actors and the odd special effect if the script is CRAP! That's why American drama is so much better than our own home grown tripe. I feel sorry for all the actors involved, but then again, it's their own fault for not reading the script. I feel sorry also for the UK licence fee payer as this is what we pay our TV licence for! @ Ed, I think you will find that 28 days later and many other films were inspired by the original radio and tv dramatisations of Day of the Triffids, not the other way around. @ Tom: The BBC is funded by the licence fee payer not by advertising - If the BBC were to blow $40m on a two part mini series they wouldn't have much left to make those brilliant nature programmes you so like. And also the BBC channels don't have to show adverts every 4 minutes like ABC, FOX and CBS have to in the US which really is frustrating when you are trying to get into a show. Yes, you might say that if the BBC did spend the money and had a worldwide hit on their hands it might make them a lot of money - but this is risk - something that the commercial stations have their business model based upon - this is not the agenda of the BBC.